The Supreme Court order allowing the dismantling of a U.S. ship at Alang makes a mockery of India’s commitment to the Basel Convention. 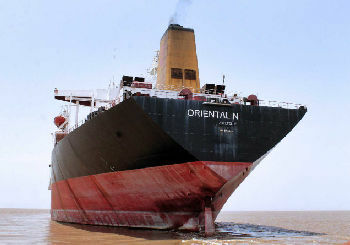 The U.S. ship Oriental Nicety, formerly Exxon Valdez, when it was anchored off the coast near the Alang ship-breaking yard in Gujarat on June 30. 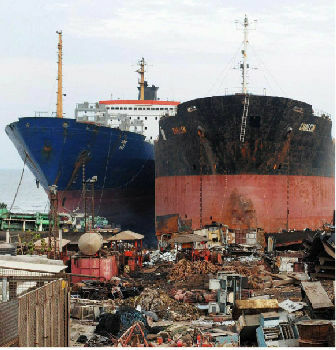 The ship-breaking industry in India had the last laugh when on July 30 a Supreme Court Bench comprising Justices Altamas Kabir and J. Chelameswar permitted the ship Oriental Nicety (formerly known as Exxon Valdez) to beach and its owner, M/s Best Oasis Ltd, to proceed with its dismantling at Alang, Gujarat. The end-of-life ship from the United States was involved in one of the worst oil spills in the U.S.: it struck a reef in Alaska’s Prince William Sound in 1989 and dumped 11 million gallons of crude oil into the sea. The ship was purchased in March 2012 by a U.S.-based company, Global Marketing Systems (GMS), one of the biggest buyers of dead ships. GMS sold it to Best Oasis for about $16 million. The ship had changed flags, from the U.S. to Panama and later to Sierra Leone. But it appears that the validity of the period with Sierra Leone has already expired, and it is now a flagless ship. According to Gopal Krishna, an activist of the Toxic Watch Alliance (TWA), this is akin to what happened in the case of the Danish ship Riky, which entered Indian waters in 2005 under the flag of a country (Roxa) that does not exist. Riky was dismantled at Alang even though the case against its beaching and dismantling is pending in the Supreme Court. In the case of Riky, the TWA has documentation to show that the Union Ministry of Environment and Forests under the former Minister A. Raja had rejected the suggestion from the Danish government that Riky not be allowed into Indian waters and dismantled at Alang because of the presence of hazardous materials on the ship. End-of-life ships have scrap steel, mechanical parts and other valuable equipment that are recycled or refurbished for use in other industries. But they also contain an array of hazardous materials, such as asbestos, polychlorinated biphenyls (PCBs) and waste oils, which, according to the Basel Convention, can have serious implications for the environment and human life if not managed properly. The Basel Convention on the Control of Transboundary Movements of Hazardous Wastes and their Disposal was adopted on March 22, 1989. It came into force on May 5, 1992. India ratified it on June 24, 1992. The Supreme Court’s order created much consternation among environmental activists, who had hoped that the court in accordance with the Basel Convention would refuse the ship permission to be beached. According to the convention, there should be prior decontamination of the ship by the country of export and prior permission from the country of import for the ship to enter its territorial waters. Secondly, the country of export of the ship is required to inform the country of import of the movement of the ship in question and certify that it is non-hazardous and non-toxic. The Supreme Court was informed by Gopal Krishna that such intimation had not been given and the Oriental Nicety had not been certified to be free of hazardous and toxic substances. There is evidence to show that the ship first entered Indian territorial waters without permission from India and without decontamination in the U.S. and then the permission of the Gujarat Pollution Control Board and the Gujarat Maritime Board (GMB) was sought to allow the ship to beach for the purpose of dismantling. In an affidavit filed in the Supreme Court, the GMB claimed that it had inspected the vessel, which was converted from an oil tanker to a bulk carrier in 2008, and that there was no sign of any hazardous/toxic substance on board. The Supreme Court, in an order on September 6, 2007, recommended the formulation of a comprehensive code to govern the procedure to be adopted to allow ships to enter Indian territorial waters and to beach at any Indian port for the purpose of dismantling. However, until such code came into force, the court had empowered the GMB, the concerned State Pollution Control Board, officials of the Customs Department, the National Institute of Occupational Health, and the Atomic Energy Regulatory Board (AERB) to oversee the arrangements. Thus, the failure to evolve a code became an excuse for these authorities to give the shipowner permission to beach at Alang and to ignore the requirements under the Basel Convention. On July 30, the Supreme Court was faced with a fait accompli: the ship had already entered Indian waters and had been certified by the GMB, the Gujarat Pollution Control Board, Customs authorities and the AERB as being free of hazardous substances. The court noted that the owner of the vessel was incurring a lot of demurrage each day while waiting for the beaching and dismantling and, therefore, permitted the ship to be beached and dismantled even though the Basel Convention had not been complied with. A view of the Alang-Sosiya ship-breaking yard in the vicinity of Meethi Virdi village in Bhavnagar district, some 260 km from Ahmedabad. A May 2011 photograph. End-of-life ships yield not only scrap steel, mechanical parts and other valuable equipment but also hazardous materials such as asbestos, PCBs and waste oils. The Bench added, however: “[I]n all future cases of a similar nature, the concerned authorities shall strictly comply with the norms laid down in the Basel Convention or any other subsequent provisions that may be adopted by the Central Government in aid of a clean and pollution-free maritime environment, before permitting entry of any vessel suspected to be carrying toxic and hazardous material into Indian territorial waters.” Had this part of the order been applied in the present case, the ship should have been sent back without beaching and dismantling at Alang. Therefore, the exception the court made in this case appears unjustified, if not inexplicable. The court has granted permission for the ship to anchor without even looking at the inventory submitted by the owner for the purpose of verification. According to a report, people in Alaska are happy that the ship is to be broken in Asia. They should be thanking the Indian Supreme Court for facilitating it.